College football’s bowl season officially kicks off on Saturday afternoon with the Gildan New Mexico Bowl between New Mexico and the University of Texas at San Antonio. And it’s pretty typical for lower-tier bowls: The combatants aren’t very good — the Lobos and Roadrunners rank No. 81 and 101, respectively, in ESPN’s Football Power Index rankings — but make for a pretty even matchup and are likely to put on an offensive show. (According to Sports-Reference.com’s Simple Rating System, or SRS, the two teams are projected to combine for 71 points, about 22 percent more than the typical FBS game.1) It’s the kind of low-stakes pre-Christmas game meant primarily for fans, gamblers or otherwise inveterate college football junkies (raises hand). A couple of years ago, I wrote about the sport’s bloated bowl schedule, and things have only expanded since. Including the College Football Playoff championship game on Jan. 9, the FBS postseason now includes 41 bowl games over the span of 24 days, tying the all-time record set last year for the most jam-packed bowl season ever. The quality of the teams involved. For this, I used the harmonic mean of the two teams’ pregame Elo ratings, our pet metric for determining a team’s strength at any given moment. (Why harmonic? To ensure that both teams in a matchup had a high rating for a bowl to get one.) The 2015 CFP championship game between Ohio State and Oregon rated as a “5” on my grading scale — it featured the 10th- and 12th-best teams in college football history (in terms of Elo at their peak) — and was followed closely by the 2006 Rose Bowl between Texas and USC. For a “1,” look to the 1947 Harbor Bowl between New Mexico and Montana State. The top bowls are as good as they’ve ever been. 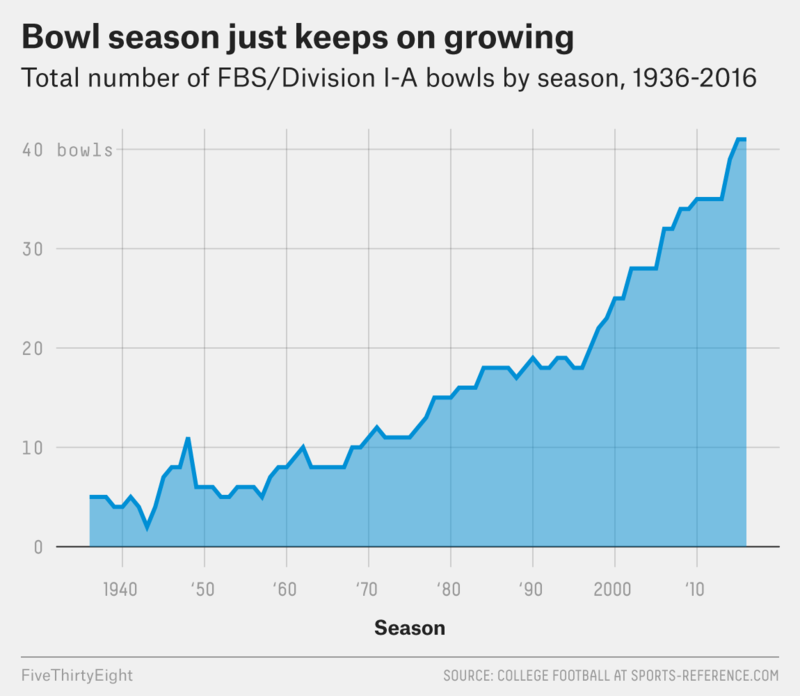 The average grade for the top five bowls in each season, for instance, increased steadily from the late 1970s until the mid-’90s, and it’s stayed roughly level since then. The same goes for each season’s top 10 bowls. But the quality of the worst bowls each year has fallen off a cliff over time. 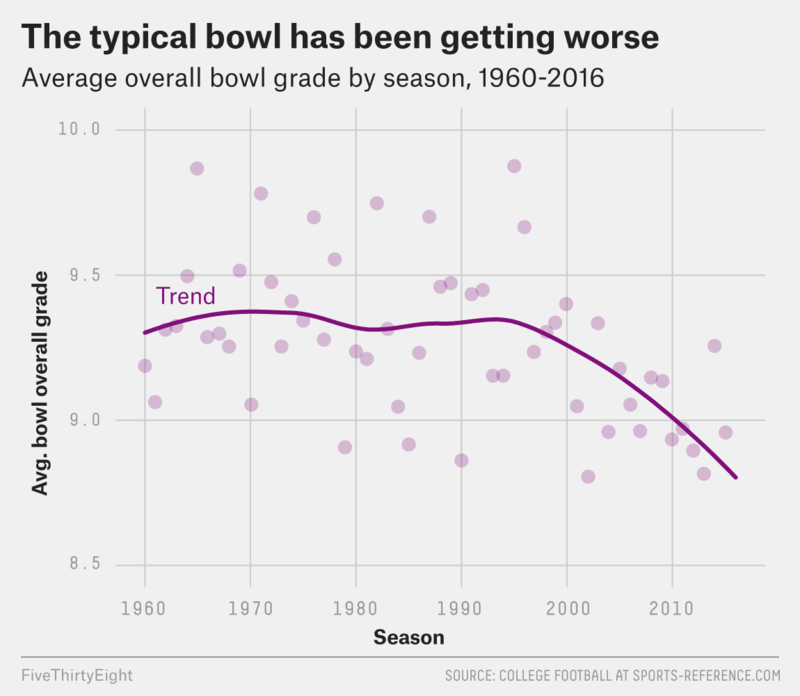 The average grade for this year’s worst five bowls is 18 percent lower than it was in 1996 and 12 percent lower than it was a decade ago. This isn’t to say that more football is a bad thing, even when it’s played by increasingly mediocre teams. Although the dregs of bowl season feature far worse programs than they used to, practically all of that dip has come on the defensive side of the ball — offensive grades for low-level bowls are steady (if not slightly up) since the early 1980s, despite the overall decrease in quality for the teams participating in them. In other words: If obscure bowls can’t draw in good teams, they appear to have countered that by featuring teams that will at least play a high-scoring brand of football. That’s partly why I’ll be tuned in for, say, Tulsa-Central Michigan or Navy-Louisiana Tech — games that may not carry much meaning for the neutral observer, yet somehow hold an appeal nonetheless. Some of that is probably wrapped up in my own nostalgia for the long holiday breaks of childhood, watching endless streams of college football at the dawn of the 1990s bowl explosion. But some is also the fun of watching unusual opponents score a ton of points on each other in the quasi-pageantry of a bowl atmosphere. Games like these are vestigial parts of a postseason system that seems hopelessly out of place in 2016 — but even so, they’re not completely devoid of charm. The formula for projecting the number of total points in a matchup is relatively simple: Take the average number of points per game for all FBS/Division I-A schools in a given season, add one school’s offensive SRS and subtract its opponent’s defensive SRS. Do the same for the reverse situation — school A’s defense against school B’s offense — and add the two numbers together to get a stat-based “over/under” for a game. To give you a sense of how predictive this is, the quarter of bowls since 1936 that were projected to be the closest ended up having a margin of victory 22 percent smaller than the quarter of bowls that were projected to be most lopsided. Since 1947, the first season in the database that featured a bowl before New Year’s Day. Since 1936, the correlation between projected and actual points across all bowls was 0.7.